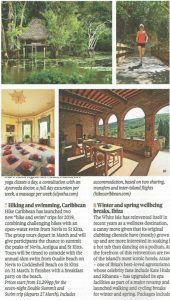 We are please to be ranked number 7 by the Observer magazine out of 25 holidays to reboot your life. You can read the full article here. It features are swimming and hiking itineraries based on the St Kitts to Nevis swim on March 31st. More information here.